The South Barrier Fence is the Southern part of the DMZ. Check point Alpha on the road to Panmunjom village is in the center of the picture. 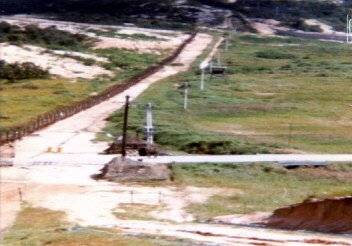 This picture was taken from "guard post 127" which was one of many observation post stretched along the entire fence line. Look hard and you can see another observation post above check point alpha near the top of the picture, and still another above that one. Click on any of the photos to return to the, "WELCOME BACK TO SOUTH KOREA" Website.